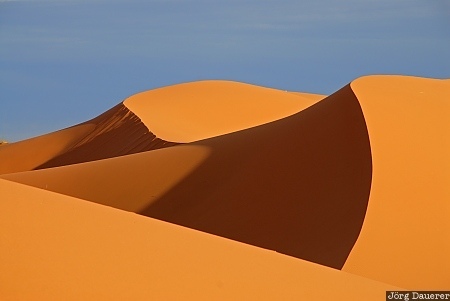 The sand dunes of Erg Chebbi at the western edge of the Sahara desert below a blue sky illuminated by warm evening light. Erg Chebbi is in Meknès-Tafilalet in the east of Morocco. This photo was taken in the evening of a sunny day in March of 2010. This photo was the image of the month in March of 2017. This photo was taken with a digital camera.